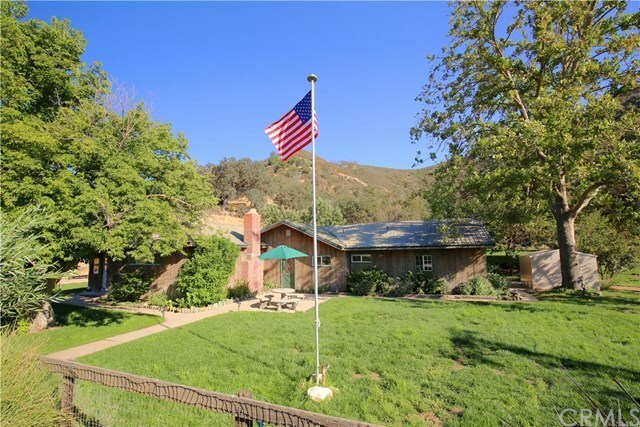 Here is a rare opportunity to own a working ranch that doubles as a recreational retreat. This 225+/- acres has everything you need for both work and play. With two homes there is room for both you and guests. Or keep the ranch manager on and use the main home as your getaway. Abundant water allows for robust cattle and horse operations and other agriculture including alfalfa or hay. Or plant wine grapes, orchard, or a garden. New well reports state the AG well produces 390 gpm, and the domestic well 42 gpm which pumps to a 5,000 gallon storage tank. This ranch is in the Williamson Act for low property taxes. The ranch is cross-fenced with 7 pastures and 3 irrigated fields. There are three barns totaling 11 stalls, plus a 10-stall mare motel, 5 turnouts with shelter, and a large arena with a Priefert roping chute, pipe holding pen, alley and lead up. Ride miles of trails, hunt in the hills, practice at the target range (100, 200, 300 yard targets), and fish the lake with its lakeside cottage with large redwood deck. Youâll love to entertain under the covered patio with an outdoor fireplace leading to a large fenced lawn area and fruit trees. The home is beautifully remodeled with an open great room, kitchen island and bar, and a woodstove. The large master bedroom has its own woodstove with hearth, walk-in closet, and French doors leading to a porch. This beautiful ranch is in the scenic Pozo Valley, close to the historic town of Santa Margarita. Directions: From Santa Margarita go east on Pozo Rd. Turn left on River Rd. just before the town of Pozo.